The sermon on Sunday titled “Surviving Financial Crises,” started the bank teller in me computing the truth about riches or lack of. Apparently when it comes to money, you need to know what you own, owe, earn and where the green stuff goes, but honestly, it is much easier (and fun) to ignore those stressful facts. Leaving the Church service, I’m challenged to consciously stop seeking more. Not that I’m this gold-digging-status-crawler (no-way Jose! ), but I admit getting caught up in unnecessary life stuff. At Target I’m spending because it’s an amazing deal, but really, I don’t need another candle, tablecloth or the latest chotchka. My challenge is to want less, pursue nothing materialistic (clothes, shoes or bargain shopping for fun) and be creatively resourceful (helllllo, coupon clipping!) with what I’ve been blessed with. I am cutting the fluff and instead of indulging in cilantro-lime shrimp, I’ll pop a can of tuna. Today I cancelled a massage and painted my own nails. This. Won’t. Be. Easy. It pushes against every cell in my All-American-unicycle-riding body that conquered a total of 19 miles the last three days and craves a massage, manicure and cilantro-lime shrimp! I trust that practicing contentment results in peace and good-life balance. In our indulgent American culture, more is more and that is the message … Get more! Therefore, looking at my life and breathing thankfulness, frugalness and joy over what I have instead of have-not can feel “back-asswards,” (as my mother would say). I want less because when I die, nada is going with me. Nothing. The only things remembered will be memories and my database of thousands of digital photos. No one will care what I wore, my car’s age, fluctuating weight or vacation destinations. For that reason, I am going to invest in thankfulness, laughter and less expensive groceries. You know … simpler things that result in being well-balanced. In other words, I want less. 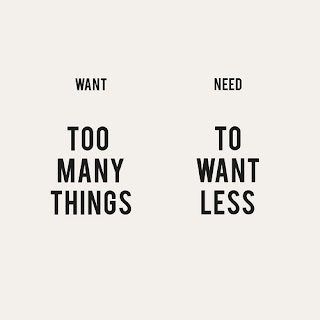 I've really never been much for wanting more, but I still want less. And after stepping on the scale this morning after eating out way to much lately, I really want less. Ugh. my word verification here is "micro". HA, I'll take it.